True story. There we were, moments ago, perusing the somewhat luster lacking offerings for the fall 2015 Portland theatre schedule (with notable exceptions to be highlighted in a future post), wondering where oh where some proper theatrical shock and awe might issue forth. When lo! What should ring into ye olde inbox but full details on the latest upcoming production from Liminal. You know Liminal. If you don’t, please go review the long list of past productions that you missed and pray for forgiveness slash redemption. The group is one of Portland’s most relentlessly exploratory and hungry avant garde energy sources. They did a piercing OUR TOWN at Headwaters back in 2013 (the year seemingly every theatre company in Oregon except Portland Center Stage did OUR TOWN). And then SANTA this past December. Apparently the not too far removed days when it might be years between Liminal events are now gone. Because Liminal is back yet again in November 2015 with OFFENDING THE AUDIENCE. That’s three shows, three years in a row!! Come November, turn out and get offended. Getting ready for that blurry line between life and OUR TOWN. Liminal at Headwaters in 2013. In 1965, Peter Handke began work on the seminal work of anti-theatre, Offending the Audience: a stripped-down, genre-defying and hilarious verbal happening that shook the establishment of the day. 50 years later, Portland performance group Liminal creates an original multidisciplinary adaptation, reworking Handke’s avant-garde classic for the modern age of pan-surveillance and fractured media self-reflections. In a fierce new adaptation that takes Handke’s experiments into the 21st century, Seattle-based polymath Misha Neininger and John Berendzen orchestrate a complex musical, visual and conceptual score out of the original bare-bones text: sonically, rhythmic sung-spoken textual textures interact with an electronic soundscape; surveillance technology confronts the audience fumbling with messy feedback loops in the dark. Offending the Audience is the third installment in this year’s series on Peter Handke, following the premiere of Radioplay I (Hand2Mouth, June 2015) and The Innerworld of the Outerworld of the Innerworld (Imago Soiree, July 2015). “Liminal’s been waiting twenty years to interpret this piece. Finally, we think we’re ready.” says Berendzen. Best known for his screenwriting collaborations with Wim Wenders (Wings of Desire, Wrong Move), Austrian Peter Handke was a major voice among the anti-theatre experiments of the latter 20th century, along with Stein, Beckett, Fassbinder, Foreman and other theatrical subversives. Simultaneously linguistic clown and ontological terrorist, he eviscerates language itself in order to expose its comic failings, giddily exploding false theatricalities in order to reveal beneath the pure presence of the raw, exhilarating and liberating liveness of the performance event. This series marks Liminal’s third plunge into the depths of Handke, following 1998’s Handke Salmagundi (an amalgam of early writings) and The Hour We Knew Nothing Of Each Other (2000), a completely silent play. Liminal is a nonprofit Portland-based network of theatre, performing, and media artists. 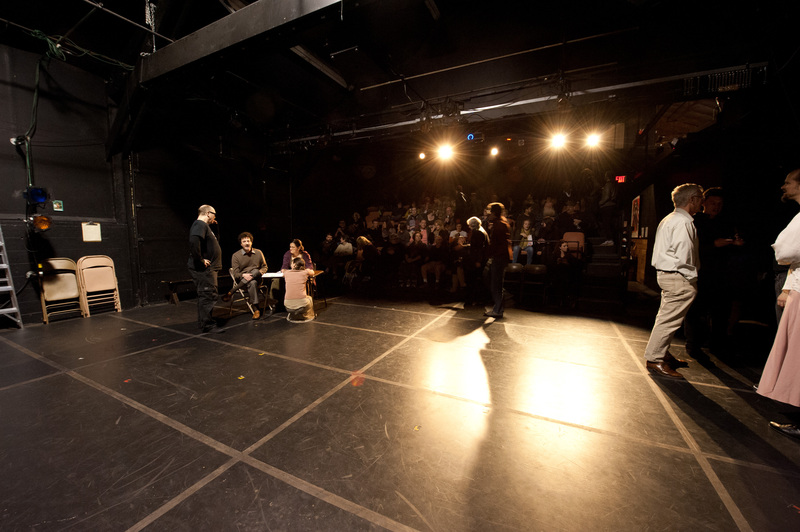 Liminal is known both for its uniquely staged plays (as in 2013’s OUR TOWN), and also for its large-scale live walk-through performance installations (as in 2012’s Liminal presents Gertrude Stein). Liminal was founded in Portland in 1997 and has produced nineteen original full-scale projects. Liminal has received numerous Portland Critics Circle (Drammy) awards, including Best Original Production (2000, 2003, and 2005); Best Choreography (2003); Best Sound Design and Best Music Direction (2000 and 2003).